The night before his assassination, President Lincoln dreamed that he was standing in a ship under full sail, rapidly approaching an indefinite shore. He reported having this dream before every major event of his presidency. Although those dreams were surely symbolic, Lincoln entered and left Washington, D.C., via vessels of muslin and wood, constructed by a builder and carpenter who had risen to the position of assistant commissioner of public buildings, Mr. Job W. Angus. 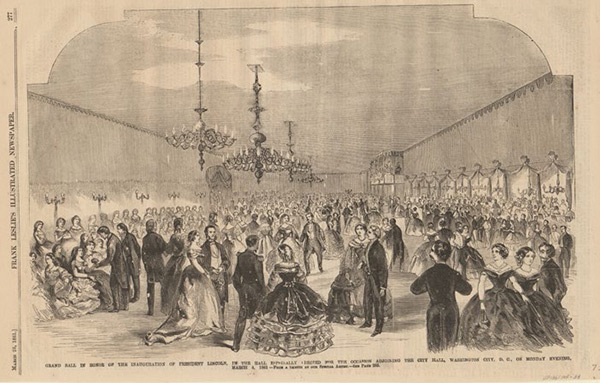 Following the election of Lincoln to his first term as president, Angus built a ballroom of yellow pine that was the site of Lincoln's inaugural ball. Located behind the 1861 location of Washington's city hall, the building was dubbed the "white muslin Palace of Aladdin." One can imagine this temporary structure draped in beautiful white fabric, evoking the tents of nomads, billowing in the desert winds. 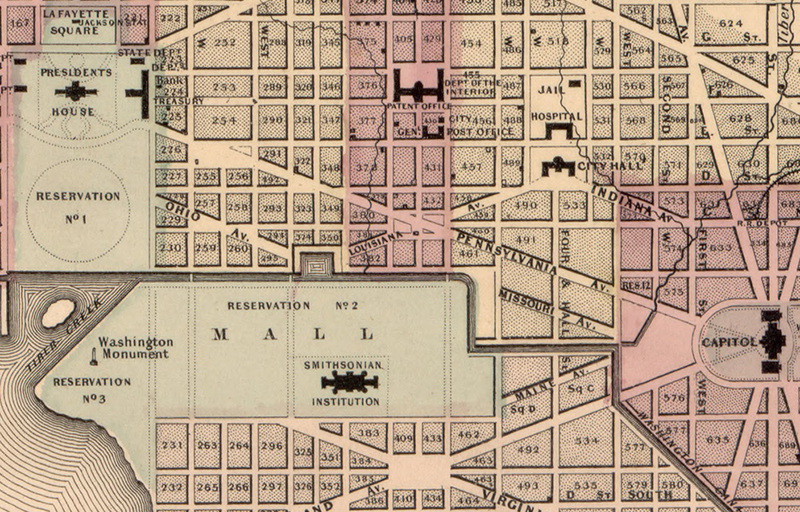 Perhaps because the ballroom was intended to be a temporary structure, it relied on the City Hall for many facilities. The council chamber was used as the ladies' dressing room while the courtroom was converted into a hat room for the occasion. The National Republican newspaper reported that, "The hall was lighted up in a brilliant manner and presented a most fairylike appearance." Apparently, the word "palace" was not lightly used, as the paper also reported, "The room itself is much larger than any ever before erected in this city for a similar purpose; and in all its arrangements reflects the highest credit upon all engaged in its construction." Four years later, Angus was again called on to build a structure for a ceremony held for President Lincoln, but this was to be a simpler construction for a sad occasion. 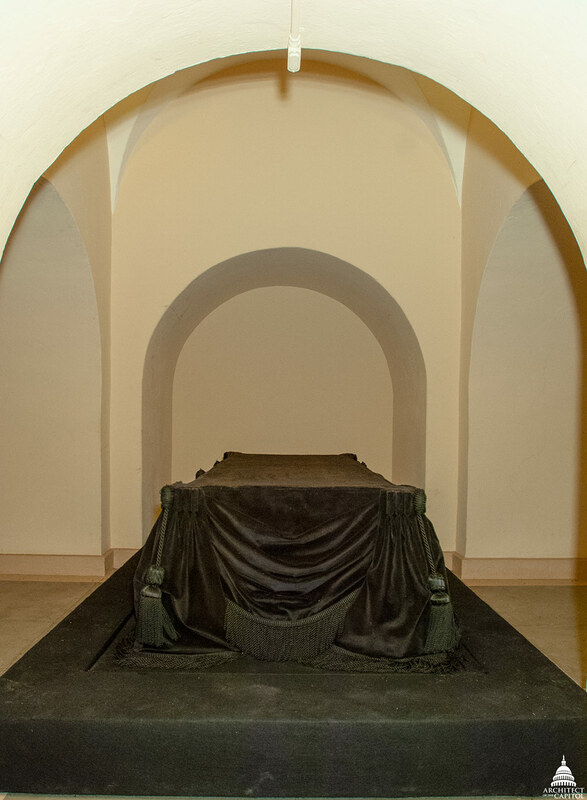 The Lincoln catafalque, constructed by Job W. Angus and others to support the casket of Abraham Lincoln while the president's body lay in state in the U.S. Capitol Rotunda. In April of 1865, news of Lincoln's assassination reached Benjamin Brown French, Commissioner of Public Buildings, who was responsible for the care of all federal buildings in Washington, D.C., including the U.S. Capitol. French closed the U.S. Capitol, began preparations for the funeral, and directed his son, 20-year-old Benjamin Jr., to design the platform on which the president's casket would rest, known as a catafalque. Angus and others followed this design when they nailed together pine boards to create a 7-foot-long platform, set on an 8.5-foot-long base. This was covered in black fabric made and trimmed by French's wife. As he quickly assembled this platform, one can only wonder what thoughts came to Angus, who helped build not only the U.S. Capitol, but also the Smithsonian Castle and other notable buildings. 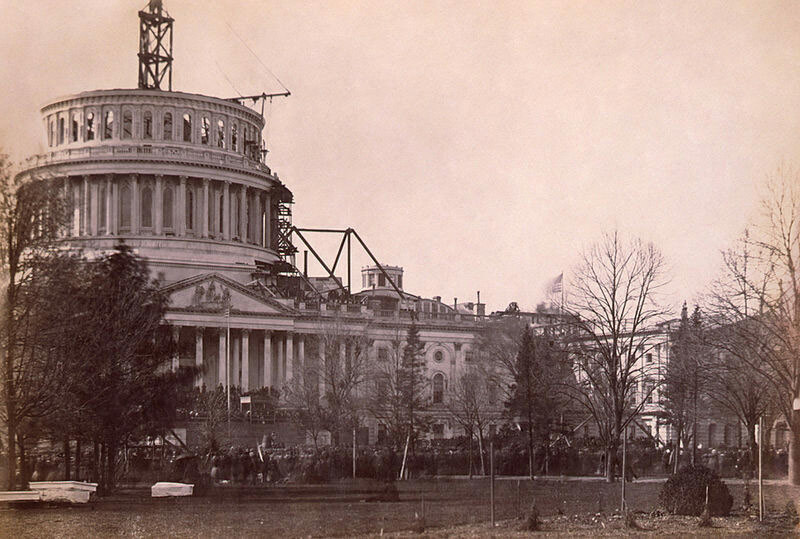 Lincoln's Inauguration, March 1861, with the U.S. Capitol Dome under construction in background. Did Angus look up to the new U.S. Capitol Dome that sheltered the catafalque, whose construction continued through the Civil War, and see it as a symbol of the ongoing building of a more perfect union, as Lincoln did? Did he reflect on the contrast of this small, dark bier, which sat under the center of that Dome, with the large, bright ballroom he had built so recently for the same man? Did he have any idea that, unlike the ballroom, which was quickly disassembled, this hastily built, simple platform would endure to bear the bodies of scores of great leaders for the next 150 years? In the U.S. Capitol Rotunda, around the low platform Angus built, Capitol employees covered the walls, the eight large paintings and all the statues but one with black cloth. Only the statue of George Washington, fitted with a black sash in the style of military mourning, was visible. As the public lined up outside, waiting to pay their respects, they were undeterred by a rain that soaked them as they slowly shuffled forward up the steps into the hushed space where Lincoln lay in state. 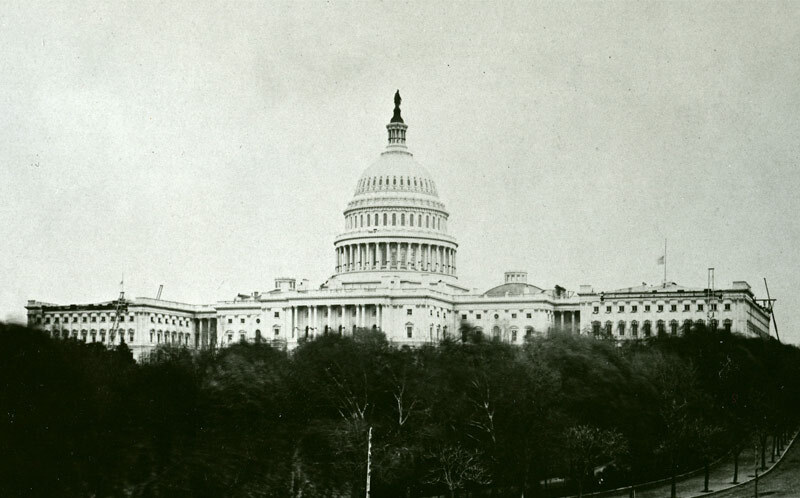 U.S. Capitol in 1865 with black bunting around the Dome following death of Abraham Lincoln April 15, 1865. A New York Times reporter wrote, "thousands wended their way up the Capitol steps, into the grand rotunda, by the bier and coffin of the President, and then out at the eastern entrance. The people clung to their friend with tenacity, and their silent homage was deep and tearful." Citizens coming together one final time was a fitting send off to the man who had observed, "If all do not join now to save the good old ship of the Union this voyage, nobody will have a chance to pilot her on another voyage." 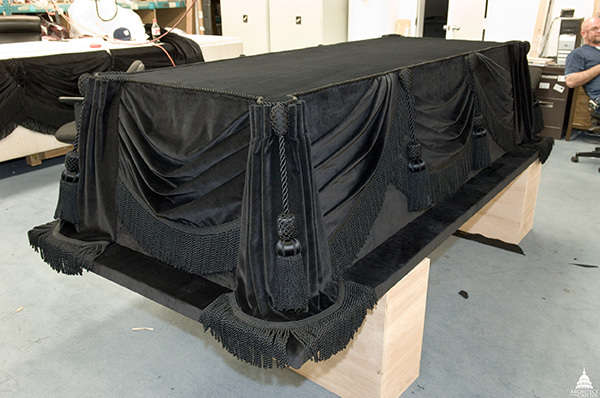 In 2006, the Architect of the Capitol carefully restored the fabric that covers the catafalque constructed by Job W. Angus and others to hold President Lincoln's casket as he lay in state. The next day, his casket was lifted off the catafalque, a simple pine platform wrapped in mourning cloth, and President Lincoln, who had piloted the nation through its greatest tempest, started his slow journey across the shores of many rivers to his final resting place in Illinois. Thanks for the very interesting historical article.